> Question Came In- Ventilation while feeding bees! I have a question that I would appreciate your advice on. Following the collection of the nuc from you 5 weeks ago, I have been regularly feeding the colony with syrup by way of a frame feeder. Now that I have a Ashforth feeder, I note that by using this type of feeder the roof ventilation will be shut off. Is this correct or is there an alternative means of providing ventilation at the roof? There is a supply of air at floor level by means of the varroa floor. The bees appear to be collecting and returning with pollen (various colours) from foraging flights, there are also stores of pollen within the frames. In addition, whilst cleaning the removable floor I disturbed two caterpillars which appeared to have cocooned themselves in debris which have fallen through the hive floor. I attach a couple of photos from which I hope you will be able to identify and advise. I appreciate this may be an imposition on my part, but any advice will be greatly appreciated. There is more than enough airflow in a beehive. The roof vents come into play during the long wet winter months allowing condensation to escape and not build up within the hive. The fact that you have an open mesh varroa floor means you have ample air flow. 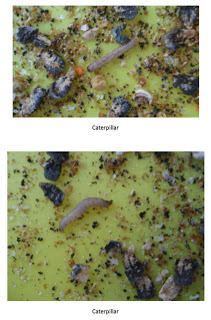 The photo of the caterpillars are in fact Wax Moth Larva– a very destructive pest to beekeeping. A moth lays her eggs in the wax debris and the eggs hatch, feed on the decaying hive litter, grow in numbers and eat through the wax combs and wooden frames, making a mess of your hive. The cocoon is the remaining open shell from an emerged moth. So to avoid a wax moth invasion, clean the hive floor regularly and remove any wax moth larva from your hive. Protect your stored equipment by sealing supers with drawn comb in plastic sacks and use acetic acid ( 1/4 cup) on a piece of carpet placed on top of the stored supers/brood boxes. Seal the bag. Careful not to inhale the fumes, do it outdoors. Then in the spring air the equipment for 24 hours before placing them on a hive full of bees. Hope that helps. Keep an eye out for our next article about buying equipment safely and the pit falls to avoid!